With Canada's 150th birthday just over a week away, I wanted to compile this list of fun and easy things to do with your family! I hope you all find some inspiration here and have a great Canada Day weekend! Most towns and cities have Canada Day activities happening, so I encourage you to check out your local schedule of events to see what fun activities and events your town has planned. No matter what you choose to do, it's always fun to dress the part. This year, our toddler will be wearing a Canada Day t-shirt with matching shorts and a Canada Day hat- so cute and fun! If you don't like the thought of bringing your kids to a crowded event, or want something fun to do once those events are over, check out this list below! Host a BBQ with red and white desserts. Strawberries are in season now! Set up a tent and camp indoors- let the kids decorate their tent with Canadian flags, red & white streamers,etc. Whatever you choose to do, don't forget to pour yourself a glass of wine once the kids are asleep- either red or white will do just fine. one of my friends live in canada so i was actually planning to got there. thnakyou for the list. 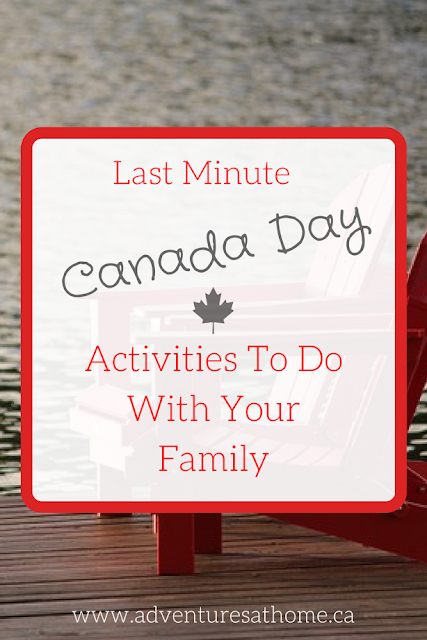 I'm not too familiar with Canada Day, but these activities sound awesome! Especially for someone like me, who hates crowds!